Regional ambulance headquartered in Bethel, working closely with Pittsfield's First Responders. Training programs for First Responders, Emergency Medical Technicians. Volunteer opportunities available. VERV program from the Vermont Department of Health. 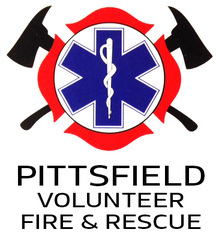 September 25, 2018, letter of appeal from the Pittsfield Volunteer Fire & Rescue.